Benny Gordon should probably build a nice little home right there in Myrtle Beach, South Carolina. But his probably won’t be right there along the sandy beach, amongst all the tourists. Instead, he should probably build his a few miles inland, right there, overlooking turns one and two at Myrtle Beach Speedway. Why? Because if ever a racetrack felt like a home to Benny Gordon, Myrtle Beach Speedway would be it. Then, Gordon experienced what might have been the turning point of his race; a pit stop that got him out in front after coming into the pits running ninth. “The car didn’t qualify that well,” said Gordon. “The first 20 laps or so, it wasn’t that good either. We just rode around really. I probably didn’t give (the car) but about a quarter-throttle after lap 20, just riding around. Those guys that are racing hard will back up to you and we knew that. We just had to stay on the lead lap. So for the first part of the race I just rode around. The two best cars this night were both from the North... Benny Gordon (#66) and Gary St. Amant (#11). He could probably drive the track with his eyes closed and his hands behind his back. He knows the track’s every nook and cranny. 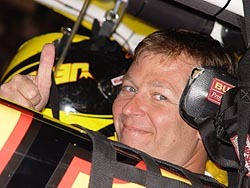 And most importantly, he knows the how to make the drive through the grass into Victory Lane. Gordon won Saturday night’s Mark Brooks Memorial 250 at Myrtle Beach on Saturday night. 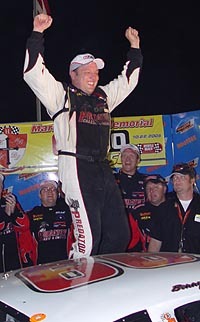 It wasn’t the first time Gordon has visited victory lane at “the Beach” in his USAR Hooters Pro Cup Series career. In fact, it was the fourth time he’s been there… in just six starts. Gordon played the perfect game of cat and mouse on Saturday. After a disappointing 20th-place qualifying effort, Gordon had to work his way from the middle part of the field and stay out of the trouble that always befalls races at Myrtle Beach. However, things were different this time. The race started with an 89-lap green flag run. That allowed the leaders to put a bunch of good racecars a lap down. But not Gordon. He was able to keep his car in front of the leaders and on the lead lap, setting himself up for the second-half of the event. 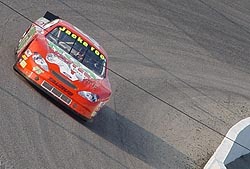 Another long green-flag run allowed Gordon to lap up to the ninth-place runner. He put the likes of Shane Huffman, Woody Howard, Clay Rogers and AJ Frank down at least one lap. But, it wasn’t just all Gordon. Coming was a bright yellow streak. And it was coming fast. Veteran Gary St. Amant was flying. 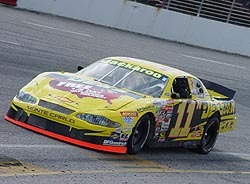 His #11 was slicing through the field and taking advantage of the long green flag periods. He found himself second, then in a matter of just a few laps, nearly made up an entire straightaway and eventually passed Gordon for the lead on lap 190. His lead was short lived though, when he came out of the pits second to Gordon after another round of stops following a Huffman spin. However, restarting the race with around 50 laps to go, things were set up well for St. Amant. Another long green flag run, which had been norm up to that point (with just three cautions in the race’s first 200 laps), would set St. Amant for the end. But this is racing, and things never seem to go as planned. Not only did the race lose its green flag look (with three more cautions in the final 50 laps), but St. Amant also got his car stuck in fourth gear, making his restarts difficult at best, and forcing him to fight from behind even more. In the end, St. Amant could only muster a third-place finish. Gary was happy with his finish, but he wanted the win really bad. 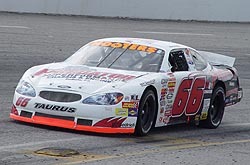 “It was a dream come true to have a car that good, it is just such a let down not to win the race when you can just pick them off on a long run like that,” said St. Amant, who is still looking for his first win of the 2005 season. “The shifter got hung up and we were stuck in fourth gear the last 50 laps. That was killer. And all the late cautions and the shifter problems for St. Amant eased Gordon’s worries, until the last 10 laps, when Jeff Agnew decided to make a charge. Agnew made a valiant charge on Gordon, but only made up ground with Gordon had to move up a lane to pass a lapped car. One time, Angew took a shot, but Gordon had too much in the end. Contradicting what he did in the first 100 laps, Gordon turned it on at the end. “Late there, I really didn’t look back. My spotter is awesome. He keeps me intact with everything that is going on around me and gives me car lengths and all. I just had to keep hitting my marks and keep hitting the same spots over and over. Jeff Agnew also tried at the end, but didn't have enough for Gordon. Bobby Gill was able to make up a lap and finished the race in fourth, while Brad Rogers came from his 30th-place qualifying effort to finish fifth.